No Photoshop here! 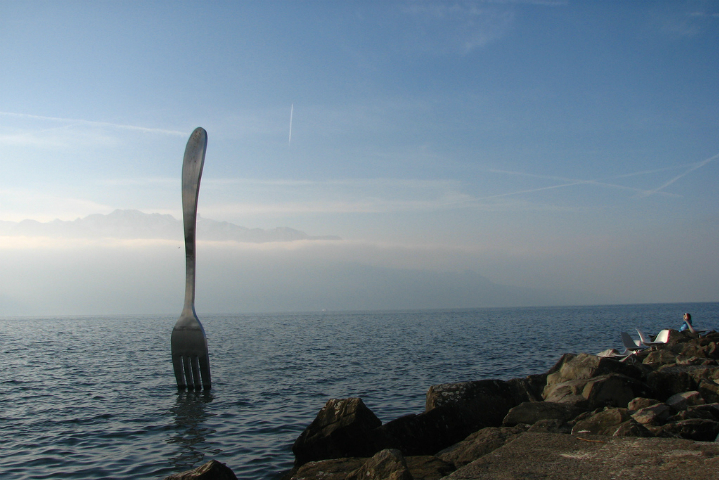 La Fourchette is a real sculpture, made by Jean-Pierre Zaugg, in Switzerland. Complaining, just like sticking a dinner fork in your head, is optional. Complaining just makes bad situations worse! Instead you can transform them by channeling your inner teen rebel part. “My mother made me do marching band through high school because she was adamant it would help me get into a good college. I played flute from 10-18. I hated it so much! In late August before my freshman year I spent the last week of my vacation in marching band camp. It was HOT, really hot out, and we were practicing formations. For us freshman this was a new experience and we were having trouble with it. The band teacher Mr Smith kept making us start over and each time he blew the whistle we would groan in frustration, sweatiness, and irritation. Mr Smith was becoming very impatient with our negative reactions and finally expressed his irritation from the platform. Well then. Now we were hot and irritated and we hated him! So we got snarky and sarcastic. Every time he made us redo something, we went out of our way to scream WHOOOO HOOO YAYYYYYYYYYYYY and then RUN to our next spot and make comments like OH GOOD I WAS HOPING WE WOULD DO THAT AGAIN. We all started laughing so much every time we did it, and to all of our surprise….we started having fun and not caring so much about having to redo the moves. The hot day flew by and we got to go home for lunch and rest before evening practice. #1: Don’t stick a dinner fork in your head! Channel your inner teen rebel instead. The 1st reason I love this story: you don’t have to suffer your suffering! Suffering is optional. Janice’s experience shows how it’s possible to have pain but not suffer it. She and her marching band buddies even managed to have fun with it. Of course some experiences are so painful, so extreme, so traumatic, that suggesting “have fun with it!” would be cruel. Choosing not to suffer your suffering is a decision only you can make. What would your inner teen rebel do? What can’t it do, because it would be too crazy? Sometimes just thinking of what your inner teen rebel part would do is enough to make you laugh and get you out of your suffering. You can’t always do what your inner teen rebel part wants you to do. But you can look at the qualities of that idea and think about other ways to get them. Laughter, freedom, fun? For Janice, laughter and camaraderie disguised rebellion. It IS humanly possible to co-create your reality. You can transform reality. You can co-create it. What’s happening is happening. But the way you handle it is up to you. The movie Life is Beautiful is an even more powerful example of how you can transform reality. The movie is set in the 1930s and a Jewish man and his young son are held prisoners in a concentration camp. If you sit with the idea of making the horror of a concentration camp into a game, it will change you. Don’t stick a dinner fork in your head! First, notice this is suffering. Become aware that you’re suffering and acknowledge it. Acknowledge it by understanding it is distressing. For Janice, she was hot and miserable. That should point the way towards a clue about what DO you want. Janice and her friends wanted to be having fun during their last week of summer vacation, not marching across a football field over and over again. Access your inner teen rebel. Let this part of you inform you. The trick to let your thoughts follow your impulses, needs, and wants. That’s easier to do when you’re younger and less set in your ways. What qualities do they have? Rest? Joy? Playfulness? Creativity? Understanding? How can that happen too? Even though you’re older now, you still have your inner teen rebel with some wild ideas and since it is a part of you actually you can access it anytime. Allow this part of you to guide you and tell you what it would do. Don’t let this part take over or you might find yourself in some hot water! But let it advise you. Find out what it would do to change your perspective and transform your suffering. “Missed…” by Flickr user µµ is licensed under CC BY-SA 2.0. Share the post "Complaining is Like Sticking a Dinner Fork in Your Head"